In the Studio Control Room at Access Fort Wayne, a clip of a steam engine locomotive pulling a train plays on the monitor. It is one of a few that are being considered for a skit segment called the “Mail Train” for the Uncle Ducky Show. The idea is to announce an on-air “mail-call” by way of the video (which will be framed by the farmhouse set window) and it is just one of many ideas utilized to make the show unique. 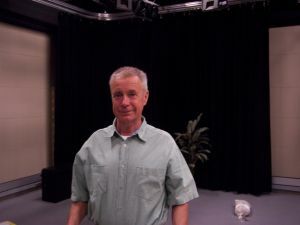 Over the years, Public Access has had literally thousands of shows produced and broadcast from their studio headquarters at the ACPL. Many shows have had their run and passed by the wayside but many have survived as well and have built up their own iconic stature in the cultural landscape of Fort Wayne. One of these shows is the Uncle Ducky Show. Started in October of 1984 and celebrating 25 years, the show is still being produced and broadcast regularly at Access Fort Wayne. The Uncle Ducky Show is the brainchild of Doug Wylie, a soft spoken locomotive engineer for Norfolk and Southern. But for many folks in Fort Wayne he's “Uncle Ducky,” hosting a show populated with a plethora of characters played by friends and associates. There's “Persey the Paranoid Hand Sock Puppet” performed by Fred Motley, who also does “Moo-Moo the Cow” and “Ponzini the Groundhog,” a puppet who Wylie says is always present and provides the show with playful sarcasm. Two original characters, “Mr. Frankfooter” (Tony Talarrico) and “Dr. Clarence X” (Clarence Egts) have passed away and are remembered with a framed photo in the farmhouse. Over the span of the years, the show has accrued an impressive array of characters demonstrating a very active and prolific imagination in keeping the show going for so long. So where did Wylie get the idea for his show to begin with? 45 people	reviwed this story with an average rating of 4.6.